High school marching band offers so many amazing and diverse opportunities for students. Some groups travel across the state while others across the States and even a few oceans, but no matter how far a band travels, it never has to leave the blacktop practicing lot to foster lifelong friendships. Okay, okay, enough saccharine digressions. Typically, college marching bands practice a lot less than high school ones. Why? Most collegiate groups don’t compete. They perform for their fans at their home arenas and travel to maybe a couple of away games. For example, I came from a program that practiced 3 days a week, had a game on Friday, and a competition on Saturday. At UVa, we have on weeks and off weeks. On week simply means that a game will be happening at Scott Stadium that week. During on weeks, we practice Tuesday, Thursday, Friday and do a rather short warm up Saturday before the game. On off weeks, we only practice Tuesday and Thursday. Again I look back to my hometown marching band: our fees were rather high and annual. Every year, I paid member fees, shoes costs, gloves—the lot. 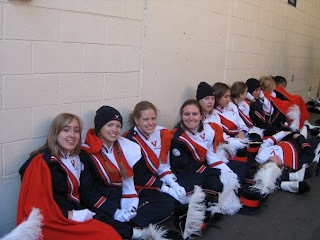 At UVa, they give you an instrument and have ZERO annual fees. You buy shoes (around $30) and gloves ($3), and that’s it. I highly recommend you come watch a college marching band. Just like with college visits, if you want an idea of what something is like, you should come talk to people directly involved, living and breathing in the very environment you're interested in pursuing. We play fun, fast paced music. This year we even played Rob Thomas & Santana’s Smooth to a packed stadium of over 60,000 people. It. Was. Amazing. Well, I'm not exactly sure how I ended up here, but let's try and figure out together. My name is Dana Lapato, and I was born in Pittsburgh, Pa many thousand years ago (by which I mean the 90s). Right before beginning kindergarten, my family moved to Chesterfield, Va, leaving behind the snow and icicles I had enjoyed seeing so often. Around 8 years old, I began riding horses and at 11, I started learning flute. Other little things I picked up were photography, archery, and the studying the Classics. By sophomore year in high school, I was in my school's Wind Ensemble and earned a spot in Latin Academy (one of the best summer adventures of my life). Fast forward and now I'm a rising Second Year at UVa, studying biology and math. During the week, I practice with the Cavalier Marching Band, as we prepare for the weekend's show. As far as classes, my tastes in subjects have often been called eclectic and probably for good reason. 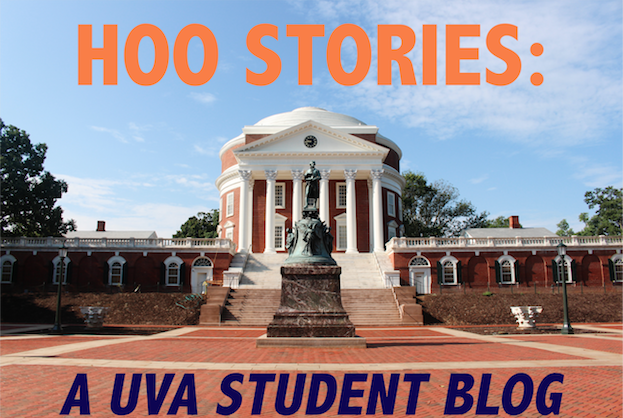 While I am on the science side of Arts and Sciences, I love languages, fiction writing, and reading (especially if it's in the original Latin--yes, I'm a geek, but then again, this is UVa). Also, if you don't read xkcd (www.xkcd.com), I highly encourage it as it could lead to new hobbies and a heightened awareness of velociraptors. Hooray for Dorm Public Service Announcements.